MDF’s Wednesday pre-fest party at Ottobar has also been announced, with Mortician, Lord Gore, Antichrist Siege Machine, and Genocide Pact. 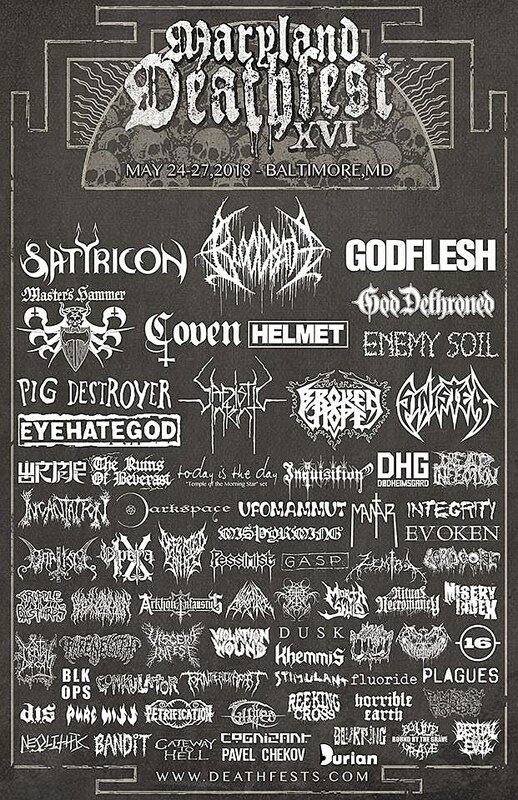 Previously announced names include Satyricon, Darkspace, Incantation, Inquisition, Misery Index, Master’s Hammer, Today Is the Day, Pig Destroyer, Integrity, Helmet, The Ruins of Beverast, Coven, Eyehategod, Ufomammut, and so many more. Updated day-by-day lineup below. The fest goes down May 24-27, with the pre-fest show happening May 23. Tickets are still available.